The Battle of the Five Armies is the third and closing chapter in The Hobbit series based on of J.R.R. Tolkien’s classic fantasy novel. The film is the finale in the sextet of Tolkien adaptations directed by Peter Jackson also including The Lord of the Rings trilogy. 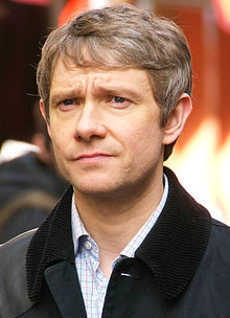 Freeman as Dr John Watson during filming of Sherlock in 2010. Picking up from where the cliffhanger of the last episode left off, this action-oriented installment opens with Martin Freeman playing Bilbo Baggins, and his dwarf pals. They are fretting over unwittingly awakening Smaug, played by Benedict Cumberbatch. The ferocious, fire-breathing dragon has left his mountain lair and is venting his wrath – and flames – upon the helpless citizens of Lake-town. Eventually, Bard the Bowman arrives, to save them. Played by Luke Evans, the intrepid archer takes aim at the seemingly-invincible Smaug’s Achilles’ heel. However, piercing the tiny bare patch of skin on the dragon’s vulnerable belly doesn’t settle the question of who gets the gold and priceless baubles still sitting inside the now unprotected Lonely Mountain. As word spreads of the demon’s demise, greed gets the better of assorted individuals who descend on the area to stake their claim on the vast treasure. Only the arrival of a horde of evil orcs doing the bidding of the avaricious Dark Lord, Sauron the Necromancer, also played by Benedict Cumberbatch, inspires the contentious masses to end their hostilities and join forces against a common enemy. Clocking in at a mercilessly-brief 144 minutes, The Battle of the Five Armies is not only the shortest, but the most entertaining of Jackson’s Tolkien screen adaptations. Between an engrossing plotline and virtual non-stop combat, the film proves to be just the perfect way to bring down the curtain on a storied fantasy franchise.